China wants SCO (the Shanghai Cooperation Organization) to counter the US, but Russia wants it to counter not only the US but also EU, i.e. making it the eastern camp to counter the Western camp of EU and US. SCMP says in its report “Security trumps rivalry as India, Pakistan to join China-led regional bloc” yesterday that India and Pakistan will both be admitted into SCO. SCMP’s report regards SCO as China-led. That is natural as lots of media and politicians believe that the rising China will take over world leadership from declining US let alone SCO leadership. In fact, as neither Russia nor China wants to be SCO’s sole leader, SCO is led by both China and Russia. That’s something unbelievable! We all know that only one tiger rules a mountain and that it is impossible for two tigers to cooperate in ruling one mountain. However, that is for tigers. Human beings must be wiser. However, the Thucydides trap precisely reflects human beings’ tiger mentality. No, tigers are wise, but human beings are stupid! When there are two tigers in a mountain, they do not fight for dominance, let alone killing one another. One of them simply leaves and goes to rule another mountain. The Thucydides trap is entirely human. It has given rise to the cruelest wars and massive killing. The death toll in one of the world war due to the trap exceeded 10 millions. We should say Russian leader Putin and Chinese leader Xi are both exceptionally wise so that there can be two leaders in SCO. It is really exceptional. However, there will soon be something even more exceptional: India and Pakistan the two archenemies will join the same organization for cooperation. The report points out the trouble China will face in dealing with India-Pakistan hostility and China-India rivalry. It forgets SCO’s another leader Putin. If Russia had not been one of the leaders, how could SCO have attracted India in the first place when India’s archenemy Pakistan wants to join at the same time while one of SCO’s leaders is India’s rival China? Putin will help Xi deal with those issues. Moreover, we shall not underestimate India and Pakistan’s leaders’ wisdom. Their participation in the same organization of cooperation precisely proves their wise intention to bury hatchets. It will be very tricky but the benefits for both countries will be terrifically great. The ease of tension between India and Pakistan will enable both of them to transfer lots of their resources to the funding of their economic development. Just imagine, how tremendously great the benefit a pipeline linking Iran and India through Pakistan will bring to India! I believe that the two countries will overcome their hostility through SCO rather than splitting SCO due to the hostility and rivalry. The report says that SCO will consider admitting Iran into the organization. An expanded SCO with the addition of two South Asian powers will enable SCO to counter the Western camp which is splitting due to Trump’s dissatisfaction with NATO and Britain’s withdrawal from the EU. Taking Iran into SCO will make the eastern camp centered on SCO much more powerful than the Western camp. Comment by Chan Kai Yee on SCMP’s report, full text of which can be found at http://www.scmp.com/news/china/diplomacy-defence/article/2096913/india-pakistan-set-join-china-led-security-group. It is evident mow Washington is a terrorist and an extremist enity waging war against all countries and nations which does not submit to its will. It is not unforeseeable the world may have to unite against its troops when it crosses a red line thst the world finds unacceptable. And the contingency plan to safeguard East Asia and Eurasia may be the SCO. Europe may hsve its European army or it’s reinvented “NATO”, South America and Carribean states its own organization, and Africa its African Union. Asia will fall back on SCO. Let’s Beijing has similar foresight to see what is to come and reconfigure the SCO for its new role. It is not about being the tiger, really. But SCO has been an organization unlike NATO, SEATO, ANZUS or any other US-led puppet organization. SCO was formed to address common problems among its founding members, specifically US-funded Islamic terrorism in China and former Soviet region such as ETIM, Chechen rebels and any other rogue rebel cells in Central Asia. It was never intended to be counter-balance for NATO. It did not even concern India and Pakistan because the US did not have active Islamic terrorist cells in these two countries. The SCO lost its main purpose when the Chechen rebel was crushed and the American got hit by 9/11. But it kept active as intelligence sharing organization of American activities in Afghanistan and remnants of terrorists still maintained by the American. However American political aggressive shift has forced Russia and China to counter the American into an alliance, with SCO as an existing working alliance. Adding India into the alliance would introduce volatile elements as India may well be used by the American to sabotage the organization from within. Therefore it is not actually wise to choose China or Russia as the sole leader as the organization can be accused of being China-centric or Russia-centric by the American. As long as the organization does not have aggressive intention the way NATO does, it is acceptable to have co-leadership to function as a forum. This way, both China and Russia will be free to pursue their own agenda without any baggage. India, for its part, has multiple agendas anyway. It has shown its willingness to conspire with the American to ‘counter’ China in the Indian Ocean to ‘preserve’ its hegemony, instead of working together with China within the SCO boundary for the security of the Indian Ocean. India also expresses its unwillingness to work with Pakistan within the SCO boundary to settle their long-time border disputes. One should wonder why India should be included in the SCO at all. So it would be better for the SCO to have joint-leadership. It is not about being the top tiger. It is about avoiding dysfunctionality. Actually I think the idea of SCO asian security forum came from Russia. I remember an interview years ago from the Russian ambassador to China saying that SCO was initiated by Russia but took the form under a Chinese name in order to keep a low profile. The idea of a security forum consisting of Asian countries was an old Soviet project back from the 60s-80s. Great Post and Nice phrase ‘Eastern Camp Vs Western Camp’. Looks like the Buddhist prophesy of our ‘World in 3 divisions or ruled by 3 superpowers’ may come to light in the next decade(s). 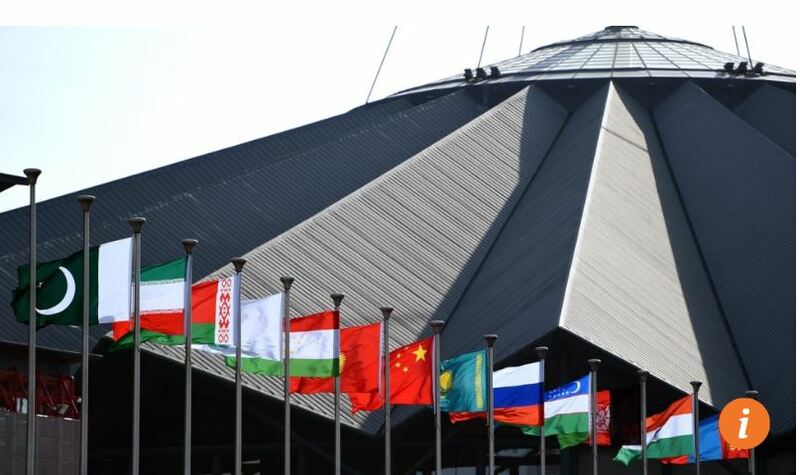 SCO has the golden opportunity of becoming a dominant organisation of member states ruling the Eastern camp and should expand to considerable size over the next decade. Pakistan and India are important inclusions for the betterment of geopolitical economic prosperity leading to enhanced security and trustworthiness along their common borders. In fact, there is no better avenue to form a geopolitical membership than SCO. Since, SCO will be led by duo leadership China and Russia, both India and Pakistan should lay aside their machete & hatchet and start acting responsibly for the sake of political brotherhood. Both are tiger democratic countries ruling their own respective mountains and yet unable to get along, but the wisdom of the auspicious dragon (China) and Russian ‘bear’ will soon subdue their animosity. Unlike EU, the memberships of SCO are not governed by the credibility of democratic value concerns nor ethnic and political divisions. India must stop participating in military drills with America and Japan before they could even be considered for SCO membership. Yes, win win all around!